Here’s the honest truth about this week’s photo: I have been trying for a few weeks to get an honest-to-goodness Christmas picture that I could post here, but it’s just not working out. As I type this it’s 60 degrees and sunny here in Oklahoma, with highs hitting the 70’s later this week which obviously rules out anything like snow, snowflakes, icicles, or anything that captures the essence of winter. I thought about taking photos of christmas lights or decorations, but I’ve done that before and it all seemed a bit too contrived. 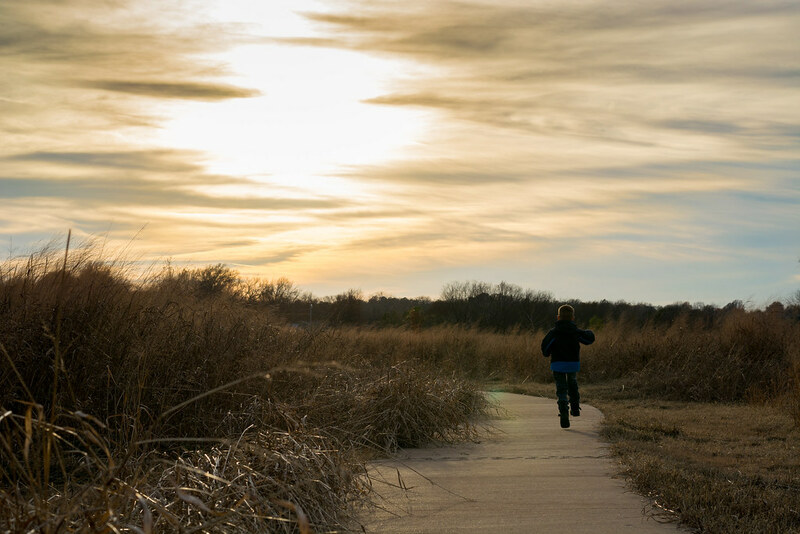 Instead what I decided to post here is an image of my eldest son skipping down the sidewalk at a local nature reserve. We like taking our boys there when the weather cooperates, and it certainly did on this early December morning when this photo was taken. I didn’t plan it and it doesn’t seem like a Christmas photo per se, but I’m using it anyway not because of what it is but because of what it represents. We are told in 2 Corinthians 5:17 that “If anyone is in Christ, the new creation has come. The old has gone, the new is here.” Matthew also writes in his gospel that “Unless you become like little children you will never enter the kingdom of Heaven.” To me these verses speak to the Christmas story as much as anything in the first few chapters of Luke. And watching my son run and skip down this path reminded me of the powerful sacrifice Jesus made for him, me, you, and all of us on this little blue marble in the sky. This pale blue dot, this mote of dust suspended in a sunbeam, this planet earth that we all call home. Jesus was born and lived a perfect life only to be sacrificed not for what he did wrong, but for our sins. That’s the true meaning of Christmas, and that’s what this season of presents, trees, lights, and carols really is all about. This photo is not perfect: the colors in the sky are washed out, the silhouette of my son is barely visible against the dark sheaves of grass, and I wish I would have been a bit closer to get a cleaner composition. But seeing it fills me with hope not just for my kids but for the new year and for all of us. With so many uncertainties just around the corner we have to choose how we will respond when we wake up each day. We can approach tomorrow with fear and trepidation, or we can choose to be joyful and embrace the challenges that a new sunrise brings. As for me and my house we will serve the Lord, and with that I wish all of you a very merry Christmas and a most blessed new year. I would beg to differ with you, I see the picture as a perfect. It’s a perfect representation of the message you were trying to convey. It’s so refreshing to come across a author / teacher like yourself who knows and freely talks about the true meaning of Christmas. Sure the lights, snow, and presents look beautiful, but the real meaning of Christmas is far more beautiful. In this festive many gifts are wrapped up but many of us will discard the wrapping and attach the gift. The giver will be forgotten too. Blessed Christmas you and family. Nicely done in all aspects. Merry Christmas! Beautiful picture and even more beautiful words of Faith. May the peace of The Lord be with you and all that are close to you, and the ever-giving God, enlarge our hearts to receive the presence of love this Christmas. I enjoy style and content of your blog posts, but I am afraid that you lost me with all the religious references. Encourage your readers to volunteer this Christmas at the food bank- OK—but please, save us from religion—- too much in the world right now! On this we may disagree Peter, but I am glad to have you as a reader of this blog nonetheless :) Thank you for your comments and, if I may be so bold, I wish you a very merry Christmas! I am afraid that there is far too little Christianity. Have a blessed day. Wonderful post this week…….speaks volumes ! Have a very Merry Christmas and Happy New Year! Thank you Bob, and merry Christmas to you too! What a wonderful message to give! I see the photo as a display of the incredible dichotomy we are a part of. On the one hand, a child skipping along the trail and living his small world. On the other, the Grand Master of the universe who created every molecule for this child to enjoy. An all powerful God, who is the I Am, sent his Son for our redemption. Thank you for creating and maintaining this site. May our Lord and Savior be with you and your family. David, you never cease to amaze me with the comments you bring to these posts. I never thought about it like that, but it’s a fascinating way of viewing not just the photo but the world around us. Thank you and God bless you this Christmas as well as throughout the new year! Simon, I am going to argue with you over the quality of this photo. I loved it when I saw it come across my Flicker feed. The sky is magnificent. It has an opalescent quality. God does not create skies like this very often. You captured it beautifully. As to your son, he may not stand out as a bold silhouette, but you captured him beautifully. There is an intimate feeling to this photo. You captured him alone, enjoying nature. He appears to be a young man who still skips, but would be embarrassed if he knew you caught him. Enjoy this glimpse into his youth. Have a wonderful Christmas. Continue to capture the magic. Thank you Glenys! It’s easy to get caught up with so much around us *other* than what Christmas is really about. Merry Christmas to you too! Thank you for your nice comments Carolana! I hope you had a nice and relaxing Christmas despite all the hustle and bustle! Great photo. I’ve been in OKC the last couple days and I couldn’t complain about the weather. Have you ever been down to the Ice sculptures that they do at the Gaylord in Dallas. They fly folks in from China every year and it is impressive and Christmas-sy. Love the message you posted with this photo!